You won't have to google for a Chromebook anymore... wait. What? The usage figures might not look good, but if you want to buy a Chromebook, Google wants to make it easy for you. On Monday, the tech giant announced in a blog post that Chromebooks will be made available globally in "three times more stores than before". With more than 6,600 stores around the world slated to carry Chromebooks, David Shapiro, Google's head of marketing, said: "Chromebooks make great computers for everyone in the family - and now you shouldn't have to look very far to find one." In the US, Walmart and Staples, along with others, will be joining Amazon.com and Best Buy as retailers selling Google's laptop offering. Joining Dixons in the UK will be Tesco stores, while Netherlands will have them in at Mediamarket and Saturn stores, FNAC stores in France and Elgiganten stores in Sweden. Australians will be able to find Chromebooks in JB Hi Fi and Harvey Norman stores. 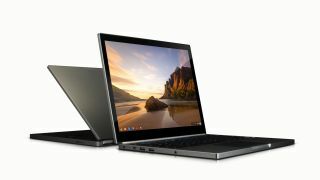 The Google also said that it will bring its laptop to other countries later this year. If you aren't searching Google for Chromebooks, try some other blips instead.